I am so pleased to say that I’ve just been appointed as a Trustee for the Blackthorn Trust. This garden and therapy centre near Maidstone is a very special place that I’m proud to have supported for several years now. Anyone can be struck down with illness. For some, however, illness becomes a life-long struggle which can result in losing a job, friends and a love of life. Blackthorn Garden is a community where by working together, one can find friends and security, learn new skills, feel valued and gain confidence to face the world at large. The Garden was founded in 1991 and has attracted strong support and funding from Social Services and the NHS ever since. It also benefits from grants and donations from national and local charitable trusts, local businesses and individuals. 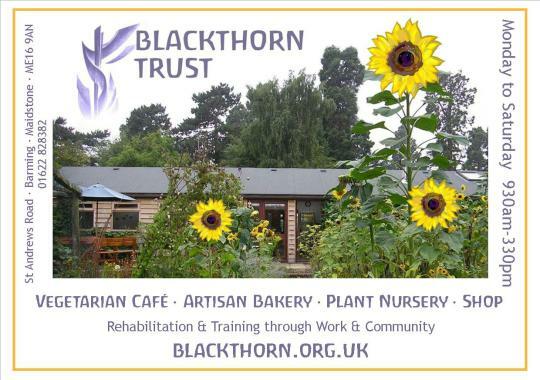 Blackthorn Garden exists to assist individuals (known as co-workers) with a range of mental and physical health conditions, to build or gain confidence and self-esteem and to develop life and work skills. And this video is a wonderful introduction (it’s silent for the first few seconds so don’t panic!). If you are a garden writer, or interested in therapeutic gardens, and would like to find out more, do please let me know and I’ll do what I can to help! But in the meantime, I invite you to look at their website and maybe even sign up for the newsletter. And I can thoroughly recommend the cakes and very special bread from the cafe!!!! It’s a perfect place to write too.